If you’ve never been camping before, you’re in for a real treat. The right campground can provide you with an amazing vacation experience. In addition to getting in touch with nature, a campground can help to promote family harmony and actually strengthen the marital bond. Camping is a communal experience which is meant to be shared with family and friends. Therefore, it’s the perfect opportunity to solidify the most important relationships in your life. But how do you go about finding the perfect campground? Admittedly, it may take some effort on your part. For instance, you may want to consult trusted friends and colleagues to find out about a campground that they particularly enjoyed. In addition, you might want to explore the Internet for an array of camping possibilities. Just be aware of the fact that not all campground websites are created equal. Some are simply more authoritative sources than others. In other words, there are some sites you can trust, and others that you should simply ignore. You should also be aware of the fact that there are, generally speaking, two categories of campgrounds: private and public. RV parks and camping resorts owned by individuals or businesses are examples of private campgrounds. In contrast, public campgrounds belong to the government and consist of national parks, state parks, and bureau of land management areas. Which type of campsite you ultimately select, public or private, really depends upon your own individual tastes. You can find out more about national parks through the website known as Park Net. Meanwhile, a site called Reserve USA will provide you with information about the Forest Service and Army Corps of Engineers. Interestingly enough, L.L. Bean offers its own directory of state parks. When it comes to exploring camping websites, it’s highly important that you read the fine print. In other words, you need to know such things as whether the site offers laundry facilities, electrical hook-ups, and sewer service. You’ll also want to find out whether the site is close to supermarkets and other shopping venues. In addition, you need to find out how close the park happens to be to amusement parks and other attractions. Before you begin your camping adventure, you’ll want to prepare a list of the things you’ll need to take with you. The last thing you’ll want to do is to make dozen of trips to the store to replenish your supplies during your camping trip. With careful planning, you should be able to amass all the equipment you need to make your camping vacation a pleasant experience for the entire family. Besides the tent, sleeping bags, and cooler there are many essentials that must be brought in order to have a successful, enjoyable camping trip. Depending upon the environment where the camping trip will be, these essentials can vary according to the terrain, whether, and any flora and fauna that may be encountered. Also, who is going on the trip must be considered – children may require different gear from adults. A first aid kit is absolutely essential no matter the camping environment or the makeup of the group making the trip. Camping trips, by definition, are to areas away from civilization and should an injury occur it could be some time before professional medical attention is available. That’s why it is so important to have a first aid kit packed for the trip. In every first aid kit, there should be a flashlight with working batteries. Be sure to check that the flashlight works before leaving home. This flashlight should be additional to other flashlights more casually used. It’s there in case of an emergency and other flashlights are not available. Also, the kit should contain a whistle. The whistle has a dual purpose – a method for locating lost campers and for scaring off wild animals. There should be a whistle for every person in the group and they should be worn whenever a trek into the wilderness is begun. Also, the kit needs tweezers, cloth bandage for wrapping sprains, etc., band-aids for small abrasions, anti-itch cream, burn cream, aloe vera for sunburns, a thermometer to check for fevers, antiseptic (Listerine works), pain medicine (Tylenol, Ibuprofen, or aspirin), and a first-aid handbook that can provide guidance in the case of an emergency. In addition to the first aid kit, basic necessities and tools should be packed. Pack flashlights for adults, and one for each child if children will be camping – this will avoid arguments on who gets to use the flashlight. Battery powered headlamps can provide light for nighttime activities. Campfires do not provide adequate light for nighttime cooking, for example. Wooden matches and a lighter are always needed for lighting campfires and serve as a backup for each other should one method become inoperable. Be sure to bring screwdrivers, a hammer, and a camp knife. Also keep a fire extinguisher handy just in case. Finally, some duct tape should be packed. Duct tape can fix unseen tears in tent material that become a problem should it start to rain, plus it has many other uses. All the items already mentioned are essential for a successful, headache free trip. Other items that should be brought include personal hygiene items like toothbrushes/toothpaste, shampoo, a mirror, brush, etc. Be sure to pack toilet paper and a shovel for when nature calls. If you’re camping in the summer time be sure to pack sunscreen and lip balm. Lip balm is a nice item to have during the colder months also. Be sure to bring bug repellent and some bug candles. Bug candles when lit help keep away the bugs from your campsite. There are also some simple items to bring that can increase the comfort level when sleeping in a tent. Cut down a piece of carpet to the size of your tent and place it inside when the tent is up. This will provide a great comfort enhancement to the hard ground. A camping stove will greatly enhance the camping experience when it’s time to eat. While it is fun to cook on the open campfire this can be impractical when cooking hamburger meat or fish, but it is perfect for roasting marshmallows. Also, campers might consider investing in a cooler that operates off a car battery. These are really small refrigerators that plug into the cigarette lighter. These eliminate the need for ice – which melts, of course. Be sure to research the area where the camping trip will occur so you know what to expect. Sometimes, if bears are active it is recommended that food be kept away from campers to avoid confrontations. Also, at certain times of the year poisonous snakes may be about or poison ivy could be abound. 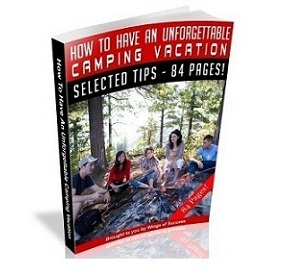 Be sure to look into this before embarking on any camping trip to ensure you are ready for what might come up. Camping can be a great get away from the workweek we all experience. It is a time to enjoy the outdoors and get a breath of fresh air, BUT have you ever thought that whether you have everything you need to do a perfect camping trip? To answer this question, it would be better to draw on my camping experience in your efforts to determine which camping equipment would be best suited for your excursion. You should always be prepared for any type of condition or coincidences that may happen. No matter where or with whom you decided to go, there are a few things that you should always remember to take with you. Some of the basic indispensables, that will not only make your trip fun, but much more enjoyable and safe are a tent, sleeping bag, proper clothing, proper footwear, flashlight, backpack, food, water, Two decks of playing cards, Reflector Oven or Camp stove Oven, Hatchet, Bow saw, Trash bags – Use grocery bags during the day and put in a large bag at night, Matches – The strike anywhere type, Toilet paper, Fuel funnel- For stove and lantern, in a plastic bag, Tent repair kit, Mixing bowl, and a compass. With your kit, you are ready to go camping anywhere at anytime. So make your list and take a day to gather supplies and set up your own camp kit, you will be glad you did. BUT like many other activities the best time to purchase cheap camping equipment is at the end of the season. It can take some time to choose the equipment that is best for you, but also allows you to buy cheap camping equipment with the selection being so large. The best thing to enjoy your camping is to try to make some activities you have never used to do like, hiking, fishing, rafting, it is your chance now to do whatever you dreamt to do. You want to remember to keep safety in mind while camping. Know where you are going and how to get home. The length of time you will be away. If it is a short time such as a few days or over night then you will only need a small amount of food and clothing. Cooking can be kept to a minimum. For longer periods away you will have to take more food and better cooking equipment. The time of year is an important consideration. If it is in the summer months then light clothing is all that is required. If it is in the cooler months then you will require heavier, warmer clothing and better rain wear. Remember to always take good quality rainwear regardless of the weather forecast. Are you camping out in the wilderness or are you staying in hikers cabins. This will determine whether you need to carry a suitable tent. The most important thing is not to pack any unnecessary or heavy items of camping gear that you probably will not use, especially on a short trek away. For those weekend stays away in the wilderness, if you do find something that you left at home, then it doesn’t matter. It is only for a day or two and you can not take everything. Start your day off right with a breakfast that will get you ready for a day of hiking or exploring. Slice up some mushrooms, onions, bacon and potatoes and grill in a skillet over the fire until done. Mix eggs with a little milk and pour over the mixture to heat until the eggs are fully cooked. This is a great skillet meal that is easy to prepare and clean up. Another easy meal to prepare is a breakfast taco. Cook some eggs and place inside a tortilla with cheese and picante sauce. If you feel a bit more adventurous, try a breakfast pizza using pre made crusts and eggs. You can cook the eggs any way you like them and add bacon, potatoes or sausage. Heat the pizza crusts over the fire and top with your egg mixture and cheese. Keep lunch simple and easy to prepare and clean up so you get back to your adventures. Sandwiches are a great lunchtime treat using easy to store and prepare foods. Sliced lunch meats with vegetables on bread make the perfect pick me up. For a hot side dish to accompany the sandwiches take some frozen French fries, chili and cheese sauce; combine them in foil, wrapping it tightly. Throw the package on the fire and cook until the fries are cooked through and then enjoy your gooey chili cheese fries. Dinner consisting of a hearty stew is a great option. Using canned vegetables, mix equal parts of your favorites in a heavy pot. These can include corn, peas and beans. Also add a can of chunk chicken and pre made barbecue pork. Add two cans of tomato sauce and two cans of chopped tomatoes and simmer slowly over an open fire for a filling stew. If you went fishing and were lucky enough to make a catch, fry it for dinner. After cleaning the fish, cut it into fillets. Combine one can of beer with two eggs until thoroughly mixed. To that add twelve ounces of flour, two teaspoons of baking powder and salt and pepper to taste. Dip the fish in cornstarch then the batter. Place it in hot oil and fry until the batter puffs. This is a great way to enjoy the efforts put forth after a day of fishing. No camping trip is complete without snacks to prepare and bring while you are out on a nature hike. Walking and hiking is hard work so you should bring some foods that will help boost your energy. Popcorn popped over an open flame is a fun way to prepare the next day’s snack. Trail mix is a traditional option and is limited to only your imagination. Use a combination of hearty ingredients with sweets. Combine granola, raisins, chocolate chips, M & M’s, cereal, dried fruits and nuts. Use whatever combinations you like. My favorite camping meals though, are made with pudgie pie makers (also called pie irons). They are made of cast iron or metal and have long handles. Our family uses pudgie pie makers to meal delicious treats for lunch and dinner. Bread is the staple ingredient in making a pudgie pie. My favorite is grilled cheese. To make one, butter two slices of bread. Place the buttered side down in the pudgie pie maker. This will prevent the bread from sticking. Place a cheese slice on top of each slice of bread. Close the pudgie pie maker. Place in the coals of your campfire. It will only take a few minutes for the pie to cook. Turn the pie maker after about a minute. Watch your sandwich closely. Depending on how hot your fire is, the sandwich will cook very quickly. Ham and tomato are also very good additions to your cheese sandwich. Pizza pudgie pies are popular with our family too. Again, butter two slices of bread and place the buttered side down in the pudgie pie maker. Add your favorite pizza toppings (ours are canned pizza sauce, pepperoni, and mozzarella cheese). Close the pudgie pie maker and place in the coals of your campfire to cook. Be careful when removing pudgie pies from your pudgie pie maker. Both the pudgie pie maker and your sandwich will be very hot. Another favorite type of pudgie pie that our family enjoys are dessert ones. Butter your two slices of bread and place the buttered sides down in the pudgie pie maker. Spoon in some of your favorite prepared pie filling (cherry or apple are our favorites). Cook in the fire and enjoy. And of course, no camping trip is complete without making smores. They’re also very easy to make. Start by roasting a marshmallow over your fire. Once your marshmallow is warm and gooey, stick it on top of a graham cracker and a piece of a chocolate bar, and then top with another graham cracker. Cooking while camping can really be a lot of fun. Preparing foods should be easy and require little clean up and use few pots and pans. At the end of the night, though, no camping trip would be complete without toasting marshmallows. Cut some branches and skewer large marshmallows. Hold each stick over the flame until brown and toasty. It makes a great, gooey dessert and an ideal end to your day. So, everything’s ready for your first camping trip, eh? Everything on your checklist has been prepared and you’ve already practiced with your camping equipment. The food, the drinks, even the first-aid kit is stocked. You’re set and raring to go! Well, congratulations on being well-prepared. You’ve come a long way indeed. But you still have to know a few important things before running off into the wilderness and plunking down that tent. Here are a few things that a first-time camper should know about. Camping means working too, not just playing. Even if you really, really want to get away from it all, there are some things that you just can’t possibly avoid, like chores. When you go camping, you still have to do some of them. Picking out a good campsite, setting up your tent, unpacking your gear; these all entails some work on your part. Not to mention starting a fire, cooking, washing dishes, and cleaning up your trash. Something will bug you. Right here and now, let’s make one thing perfectly clear. If you stay outdoors, you’ll meet bugs and insects of all shapes and sizes. There may be only a few, or there may be quite a lot, but be certain that you’re going to be bugged. What to do? Keep your campsite clean and tidy. Soda cans, food scraps, pieces of chips and cookie bits; they all attract insects, so make sure you gather and dispose your trash daily. Never eat inside your tent and don’t leave food lying around. Don’t wear perfumes and colognes outdoors, too. They can and will attract insects. If you must, use unscented deodorant. Remember that lanterns and bright lights are like lighthouses to bugs, so if you have one, put it in a spot far away from your sitting area. Always bring along plenty of insect repellants. Wet mornings are unavoidable. Even if it wasn’t raining the whole day or last night, chances are everything will be soaked by the time you wake up. That’s because of dew. Warm weather, coupled with high humidity, makes for an ideal environment for morning dew. This is a fact of nature and just cannot be avoided, so the next best thing you can do is to take down any dry or about-to-dry clothes off the clothesline, and cover anything you don’t want to get wet, preferably with a tarp, just before setting down for the night. Waste not. Trash can really pile up at your campsite at a rate you wouldn’t believe, especially if you’re new to this. So you better bring along plenty of plastic bags to dispose them with. Use the campground’s garbage disposal areas for this. Avoid burning your trash in the campfire at all costs. If you’re fishing, don’t clean the fish at the campsite, too. Never a good night’s sleep. Right now is a good time to tell you that no matter how comfy and warm and soft is your sleeping bag or air mattress, you’ll probably never sleep as good as you do when you’re at home. To make the best out of it, bring some sleeping pads along with your bag, as they add much-needed cushioning and insulation from the cold ground. They can also add more cushioning, which should make your sleep more comfortable. Wood from the forest – not for campfires. Picking up wood that’s lying around your campsite and using it to build a campfire is not allowed. Why? This wood is essential in replenishing the nutrients in the ground for the plants and trees. So you can think of it this way: If every camper got wood from the forest for their fires, soon there would be no forest! Whether you’re a first time camper, or an experienced wilderness explorer, it is helpful to have a basic checklist of essential gear. Of course, don’t forget that you may need other equipment, based on the specifics of your trip. Tent or shelter – Most people will want to take a tent, but you can also use a tarp or other open shelter to keep the rain and dew off of you. If it will be cold, though, you’ll probably be thankful for the extra protection a tent offers. Don’t forget to bring a fly or tarp to keep rain out of your tent. Groundcloth – Bring a tarp or plastic keep moisture from seeping up through the tent floor, unless your tent has a built in groundcloth. Sleeping Bag – Check that your sleeping bag is rated appropriately for the weather you are going camping in. You don’t want to take a -30 rated sleeping bag on a summer camping trip, or vice versa. Stove – Unless you plan to cook over a campfire, you’ll need a camping stove and fuel. Of course, whether you use a stove or a fire, you’ll need matches or a lighter. Food – You don’t want to be without that! Water – Bring plenty of water. In some cases you’ll need to bring enough to extinguish your campfire. Apparel – You’ll want a coat or raincoat to protect yourself from the elements, depending on the weather. A hat is another essential. Other than that, the main rule of thumb is that it’s better to wear layers of clothing, so you can easily adjust for the temperature. Pack – If you’re hiking in to your camping spot, you’ll need a pack large enough to hold all of your gear. Otherwise, you’ll just need a day pack or fanny pack for day excursions. Keep in mind that this list is just a basic list – you’ll find other items that you need as you start camping.